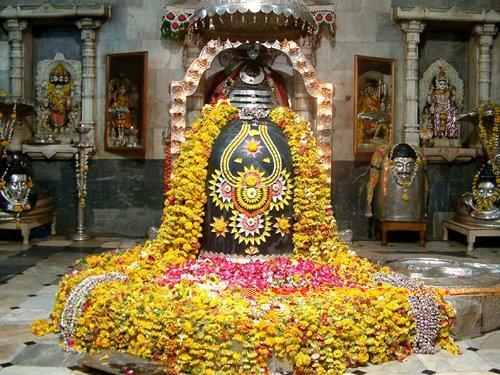 Located in Prabhas Patan which is very close to Veraval is this ancient and very revered temple which is prestigiously included among the twelve Aadi Jyotirlingas in India. Ancient texts narrate a very interesting story about the origin of the temple. As written in the ancient puranas, the temple had been constructed by Lord Shri Krishna Himself. While some texts also suggest that the temple had been constructed by Moon God himself. The Moon God had been wedded with the twenty seven daughters of the powerful Daksha Pati. But, soon the God had to face the wrath of his father in law because he had been especially close to only one of 27, Rohini. Owing to the neglect extended to the other daughters, Daksha placed a curse on his son in law, moon which caused the complete loss of his power of light. Havoc followed in the worlds but Prajapati Brahma took it upon himself to find a solution to the problem. He advised Moon to go to Prabhas Teertha and worship Lord Shiva. After a great amount of worship and repentance, Lord Shiva was pleased with the Moon God and relieved him of his curse partially which explains the periodic waning of the moon. It is popularly believed that if a person travels in a straight line, he would inevitably reach the North Pole from this place. 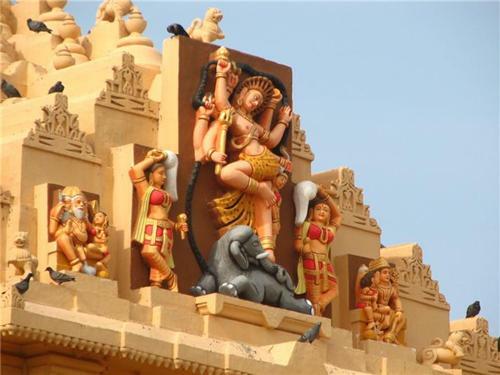 Owing to its construction which is believed to be thousands of years old and its great significance, the temple continues to be the focal point of all Hindus religious beliefs and therefore is one of the most visited places in the state of Gujarat. It is accessible from Veraval which is the closest town near it. Somnath Temple had been subjected to great destruction and plunder by various foreign rulers. But, since good always reigns over evil, each time the temple resurrected itself and resumed its prior glory. Built in the most complex and much appreciated Chanukya style of architecture, the main precinct has about seven stories and looks magnificent and invincible. The temple had been constructed by the skilled masons of the Sompuras who have literally infused life in the various carvings of the temple. It is amazing to understand that the temple had been constructed from its ruins for a total of seven times. Although the original construction of the temple is believed to have been done with gold, the next time when it was ransacked, it was built back to glory by the Maitraka Kings of Gujarat. The third structure was courtesy Nagabhatta II and other Kings who were sympathetic to the cause of the temple contributing to its rebuilding were Paramara King Bhoj and Solanki King Bhima. However, the present temple is under the maintenance of the Shree Somanth Trust which takes good care of it. There is no dearth of hotels near the Somnath Temple. For people of varied income groups, there are suitable staying arrangements in order to facilitate them. Based on their popularity among the tourists, some of the decent accommodation facilities include Hotel Shubh Suvidha which is a mere 1.5 kilometers from the temple. Other similar places are Safari Hotels & Resort, Hotel Ambar and Hotel Woodland which are two-star properties that not only provide neat and tidy rooms but also nutritious and delicious meals in their restaurants. Devotees can also have the privilege to see the ‘Somnath Tirth Darshan” which includes local sightseeing and visit to the local sacred places. 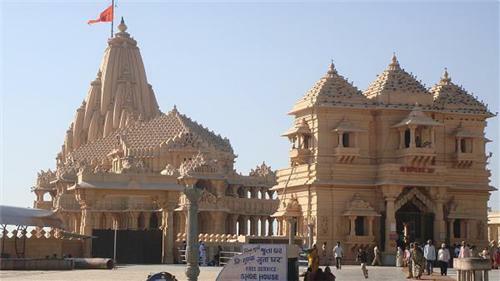 Organized and deliberated by the Somnath Trust, this tour takes place a couple of times daily and the vantage point from where people can commence on their journey is the main gate of the Somnath Temple. Available at ticket price of 20 rupees, it gives people the opportunity to witness the Golokdham Tirth, the Triveni Sangam, the Sharada Peeth and Bhalka Teerth in a span of 2 or 3 hours. If being in the bus with fellow passengers is not your thing, you can also book exclusive auto rickshaws for yourself which will take you to all the above written places for an amount of 200-250 rupees. Some of the religiously important places that they cover are the Baldevji Gufa, Lakshmi Narayan Mandir, Surya Temple, Mahaprabhuji ki baithak, Hinglaj Mata Temple and Lord Krishna Charan Paduka. Owing to the closeness of all these places within a 5-6 kilometers radius, all of them can be covered within the day giving the most enriching experience to the tourists. There are set timings for the temple darshan of the deities; in the mornings between 6 am to 9:30 pm, the temple is open for people, however the "Aarti" takes place thrice in the temple precinct- at 7 am, 12 noon and at 7 pm. A very attractive feature of the temple is the Light and the Sound Show which takes place between 8 and 9 in the evening. Somnath Temple stands as a true example of the strong Hindu religious belief. Despite all the incidents to strip the place of its glory, it has withstood the test of time and emerged victorious amidst all odds and continues to instill the love of God among Hindus. Reaching Somnath from Veraval is very easy and convenient for the tourists. There are auto rickshaws plying for very little money run by locals who are knowledgeable about the routes and also the history of the temple. A friendly auto driver taking you to the temple can enlighten you amazingly about the temple specifics. Alternatively, there are buses plying too which are most helpful in commuting groups to this sacred site. Covering a distance of no more than 5 kilometers from the Veraval railway station, it is supremely convenient to reach Somnath through Veraval.